Upper-Crossed Syndrome or UCS is a condition in which tightness or the upper traps (trapezius) and levator scapula on the dorsal side crosses due to muscle tightness of the pecs (pectoralis major and minor) creating changes to the skeletal system. A forward head posture is a indicator that you may be suffering from this condition. 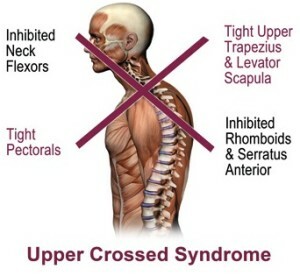 The most common cause of upper cross syndrome is long hours sitting at a desk. Over time your back muscles will start to fatigue causing you to slouch. This is turn becomes a habit and then the muscles adapt to this particular posture. What are the symptoms of Upper Cross Syndrome? The most common complaints we hear from people suffering from Upper Cross Syndrome are headaches, neck and shoulder pain. In prolonged untreated cases this causes skeletal problems as mentioned which in turn can result in pain found in the wrist and/or elbow. Our therapist will apply Myotherapy techniques to help strengthen and stabilise the weak and inactive muscles and release tightness and tension in the restricted muscles. We personalise our treatments to suit the individual as each case is different. Call us now on (07) 55220846 or use our online booking system located on the home page.